The starting point for any decision about what shoes to wear with an outfit, is that they should be darker than the trousers. So with a charcoal trouser, a black shoe or very dark brown. 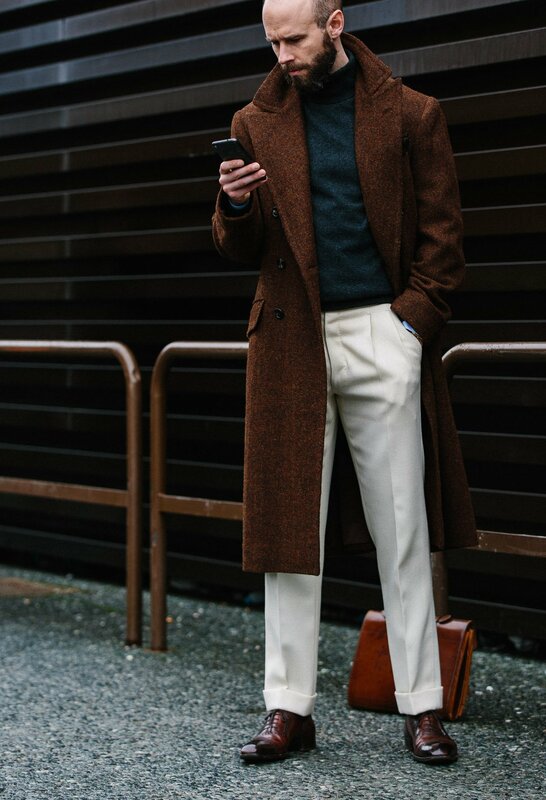 With a mid-grey trouser, dark or mid-brown (below). And only with a very light grey or cream trouser, a tan shoe (above). This looks subtler and more elegant than a bright shoe against a dark trouser. And as a result it has become common practice, social convention, and finally something we can call a rule of menswear. However, there is a tendency to think that this means wearing tan shoes with every beige or cream trouser. Readers have often commented that a combination of mine would look nicer with a tan shoe, rather than the brown I’ve gone with. Personally, I think it’s important to remember that what’s worn above the waist is also relevant. For as lovely as tan shoes are, they can look out of place with a dark tie, shirt or certainly shirt-tie combination up top. Let’s say we’re wearing a beige trouser and a tan shoe. Above the waist, a mid-blue shirt and navy tie is OK. But as soon as you darken that top half more – with a denim shirt, a grey polo shirt, or a navy roll neck – the contrast with a bright shoe becomes too strong. I know I’ve probably lost all first-time readers at this point. Who thinks about their shoe/shirt/trouser combinations this much? Fortunately I know a good number of PS nerds will be on board, so I’ll carry on. Everyone else, just scroll through the pretty pictures. So. Even with cream or beige trousers, if I’m wearing something dark above the waist, I’ll wear a mid- or even dark-brown shoe. 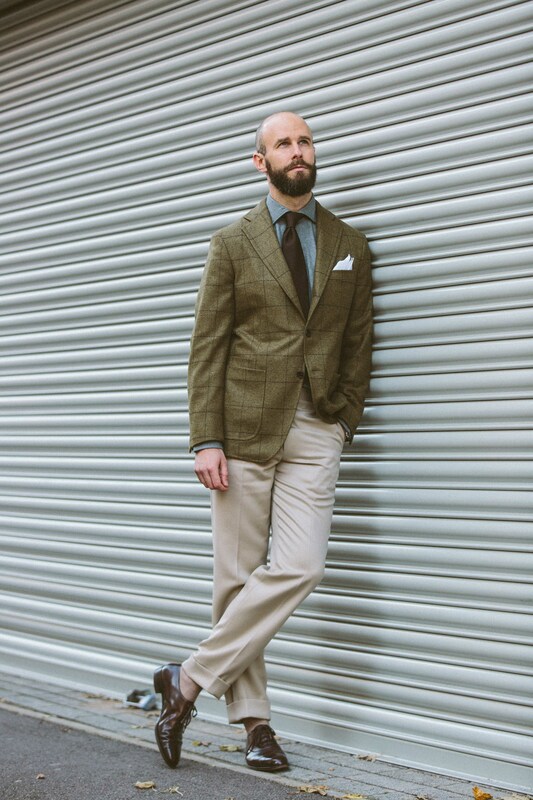 That beige colour of trouser would look great with a tan shoe – perhaps even tan suede. The bottom half would really pop. And with a white shirt above the waist, that would be fine. But with a dark shirt like this grey brushed-cotton, a light shoe would be out of place with the rest of the outfit. It would be too light and too bright. Same with this next example, with an indigo-coloured shirt. 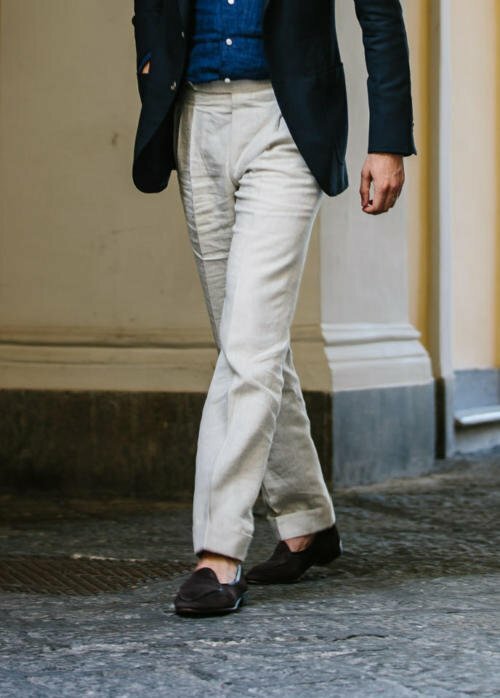 Tan shoes would be beautiful with the natural-colour of linen trouser. But they would be ill-matched with the dark shirt. And one more below. The charcoal roll neck is the dark thing above the waist; it’s under an overcoat, but that could just as easily be a jacket. It would be tempting to wear tan here. But a mid-brown shoe like these G&G adelaides is much more fitting. It might seem obvious when spelt out like this, but it’s the kind of thing I’ve done for years without knowing why. And it’s nice to be able to put it into words. Readers often say they like this about Permanent Style – that it explains and formalises their habits and instincts. In this case, I have to credit Benedikt Fries from Shibumi for helping me formulate my thoughts. Benedikt mentioned it during his appearance at our recent pop-up in Fortnum & Mason, and it immediately made sense. Benedikt is also a good example of how this works with a tie: he wears ties far more than me, and says he is more likely to wear a dark shoe when he is wearing a dark tie. Again, dark up top matched by dark below. I think that image on the left of Benedikt also shows the difference the colour of a jacket can make. 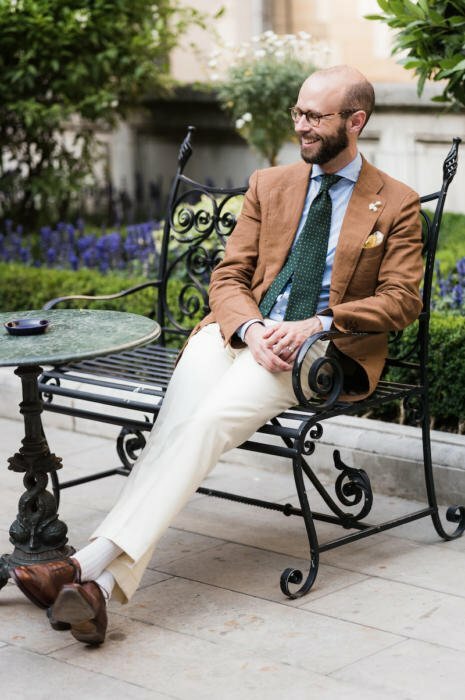 Although the tie and shirt are probably the most important things here, any strong, summery colours elsewhere also help make a tan shoe part of the whole. I think it helps in my combination below, as well. This post by the way, is part of the ‘Rules’ series, where I explain why certain rules or guidelines exist in menswear and then – once that is thoroughly understood – how and where they can be broken. You can break the rules whenever you want of course, but it’s seldom recognised that when the best dressers do so, they’re fully aware of what they’re giving up. The full list of posts in that series can be found on the dedicated page here. You can follow the discussion on The rules and how to break them 9: Tan shoes with pale trousers by entering your email address in the box below. You will then receive an email every time a new comment is added. These will also contain a link to a page where you can stop the alerts, and remove all of your related data from the site. I agree directionally with this but again you have missed something which is both important and relevant. You refer to “tan” as a colour, which it clearly is, but there is a world of difference between tan leather and tan suede. 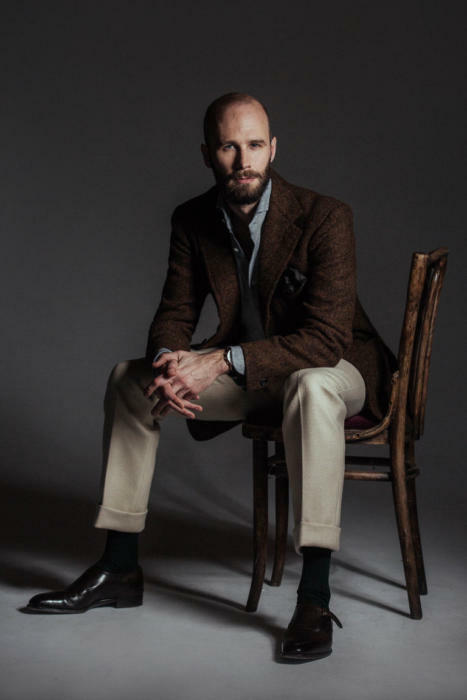 The former would look plain wrong with dark grey/charcoal flannel trousers worn with, say, a navy blazer, but the latter would actually add an extra positive dimension to the outfit. Please always recognise the difference between leather and suede, even if they cover the same brown spectrum. Thank you. Yes, you’re right of course, suede and leather do have a different effect on terms of both style and formality. Personally though I think colour is more important to this consideration, and I wouldn’t wear tan suede with a dark grey trouser. Would you really call the shoes in the first photo tan? I’d call them a darkish, reddish mid-brown. I always picture ‘tan’ as the popular walnut/diarrhea colour. Interesting way to describe tan…..
You’ve articulated very well what I’ve struggled to express . He careful with tan coloured shoes. I’ve only seen them to work with blue jeans and then we a pair of country shoes. But so many men get this wrong . Wearing them with dark coloured suits , black trousers etc. Never really thought about how tan coloured shoes may seem right on occasion but when viewed against what colours you’re wearing above the waist they won’t work. It can look like someone wearing marigolds! Stay safe this Christmas make sure your shoes are darker then your trousers….And avoid tan coloured shoes . Nothing hurts my eyes sartorially more than men wearing navy suits/trousers with tan shoes. Great article Simon, I only came across your website a few months ago but so many of your posts articulate what has seemed mysterious to me in the past: what works and feels comfortable, versus colours and materials that somehow don’t! I’ve got to agree with Sam, I see tan as a pretty light shade, like EG Burnt Pine, or Edwardian, your shoes in the first post look chestnut to me. I have a real thing about nast tan shoes with Navr, or even bright blue suits, which have almost become the norm now, even worse tan and blue spectators. Oh, and Benedikt looks like he’s wearing somebody elses clothes – they look to small and short for him. I suppose it goes without saying, Simon, that jeans are the exception to the rule? For example, elsewear you’ve celebrated the white trainer with dark jeans….would it follow that any brighter coloured (casual of course) shoe would also be fine colour wise (tan suede for example)? Yes, very good clarification, thanks. This is just referring to tailoring, not jeans or chinos. 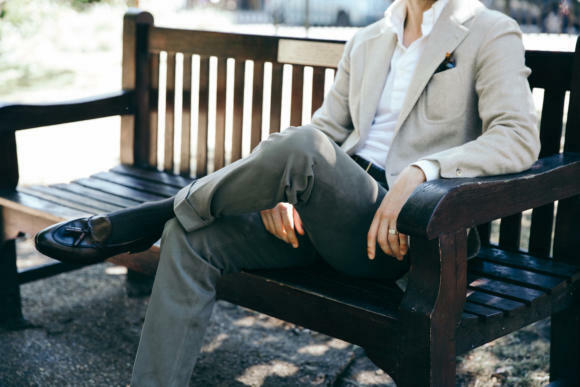 A really interesting post, Simon, and something I was thinking about just this week, in exactly the context of tan shoes not looking quite right with light trousers because of a darker brown top. I agree with Sam’s comment on what we refer to as “tan”. I have a particular dislike of the overly yellow or orange shades that seem to be so widespread. That brings me to another point, however – the difficulty of obtaining good RTW dark brown shoes. I’m not sure if other readers have experienced the same thing, but I’ve really struggled to find truly dark brown shoes that are readily available. I have a pair of C&J handgrade shoes that are really more of a mid-brown, but I’m struggling to find anything much darker. Partly for this reason I’m considering bespoke for the first time, although I would much prefer to find something RTW, not least because of the long lead times quoted to me, which are significantly longer than those I’ve experienced for tailoring. Good point Richard. Most brands tend to carry tan, mid-brown and black. How about having a mid-brown pair patinated to a darker colour? Various patina artists would do that for you, and it’s a lot cheaper than bespoke. You can also of course darken then with touches of black polish, but that might also be something you’d want to leave in the hands of someone else. Thanks, Simon. That’s an interesting suggestion. I don’t have any personal experience of having shoes patinated and the one or two examples I’ve seen with other people seem to have provided finishes that are not very robust or look rather artificial and overly stylised. What’s your experience of the durability of patinated finishes? They will last well, particularly on the areas of the shoe that don’t bend (toe and heel). And yes they are often over-stylised, but they don’t have to be. If you make it clear what you want, it can be a fairly plain finish, though you can’t avoid the mirror shine look I don’t think. Cheaney’s “burnished mocha” is nice for a darker brown in the mid-tier price point. I particularly like the “Islington Semi Brogue” but if you aren’t as keen as I am on the chiselled toe you can also get the “Alfred Capped Oxford” which is their classic almond last (think EG 82). If you want one level up from that, the Armoury’s “Pedder Captoe Oxford” (which I think is made by Cheaney) is a really great looking shoe available in a very dark “mocha”. I have the Gloucester Wingtip from that range and the make is very good, in line with C&J handgrade, but I’d warn the leather quality is a bit lower perhaps more in line Cheaney’s mainline (and I’d guess where most of the £150 saving is coming from). I don’t really have personal experience above £550/pair but I think Simon said something before about Edward Green’s bronze colour MTO? Thanks for the response. Unfortunately, I’ve tried both of the Cheaney models, but neither of them really suited me. I have the Cheaney Cambridge in black, which is on on a different last, and that’s a slightly better fit, but doesn’t come in mocha, unfortunately. I had a chat with someone at the Edward Green store in Jermyn Street, but didn’t find them very helpful, to be honest. It was all a bit “take it or leave it” and again the lead time was quite long. I seem to be a bit stuck, being reluctant to go for bespoke due to the cost (of some makers) and the very long lead time (of all of them) and the very limited availability of dark brown shoes in RTW on a last that provides an acceptable fit. Very frustrating! Thanks, James. I’ll take a look at what they have to offer. G&G do an espresso shade which is a very dark brown. Though personally I prefer the oak shade, both for EG and G&G, find it a bit more versatile. I have been to C&J on Jermyn St last week (“surprise” Christmas present fromy parents) and saw they now have an on-site patina service – in the £70 if memory serves. I’m sure you could request something plain – one of the patinas they exhibited was quite simple, and very nice in the dark browns. This is a subject matter not often discussed. Well thought out arguments that inherently make sense. Vass have a number of dark brown options or you can do MTO. I’ve found the online ordering process easy and the delivery time quick (I ordered a pair dark brown suede oxfords from their website). Thanks for bringing this up. Tan shoes have become far more popular than they should be. But if only wearing tan shoes with light trousers and a dark top were the common problem. I agree with you that it looks unbalanced, but it’s not nearly as unbalanced as today’s popular look of tan (and a lighter tan than what you are calling “tan”) shoes with marine blue, navy and charcoal suits. People want their shoes to pop, but people should focus drawing attention up instead of down. The subtext seems to really be; you don’t really need tan shoes but if you really want to then suede or dark tan is preferable. Do you wear tan/cream/beige trousers in the U.K. in the winter? Yes, I tend to focus on the amount of sun rather than temperature. Say one wants only versatile shoes in the wardrobe. Tan seems to have significant limits to when it works. Are there times when a chestnut or mid-brown won’t work, and tan is needed? Can one easily forgo tan? Simon, I just reread this fantastic article and came to the conclusion that true tan,meaning lighter color, while being obviously unnecessary, may in fact be undesirable in most cases. The only time I can see wearing tan is in the Summer when wearing a light colored suit or outfit. And even under those conditions a darker brown shoe would still be appropriate and look great. At the very least, tan appear to be one of the least versatile shoe colors. Is this an accurate observation or am I missing something? No, you’re right Scott. Tan is lovely and attractive, but not versatile at all. Thank you sir, I appreciate the confirmation! Interestingly, I recently saw a clip of a James Bond movie,with Daniel Craig as Bond, where he wears a white shirt, tan pants,a black Tom Ford Cardigan, and dark brown suede chukka boots. Just google James Bond Talamone, Italy, if you want to see it. Anyway, it’s a fabulous look and a confirmation of your point of paying attention to what’s going on with the upper half of the outfit regarding color. The boots appear for just a few seconds so you’ll need to pay careful attention. Thanks again for the sartorial education! They look like mid-brown shoes to me. Great article Simon! I faced this issue last night as I was choosing what shoes to wear with my black watch sport coat and olive flannel pants. Ultimately I chose the dark brown vs mid-brown color and it was definitely the right decision. This article explains brilliantly why dark brown or black shoes are appropriate more often then not. Is it worth distinguishing between a tan lace up and a tan slip on? Potentially a world of difference with the latter being the footwear of choice of a Marbella holidaying second hand car salesman! I would disagree regarding Benedikt’s picture with the blue jacket: I find that the shoes are (much) too light vs the outfit. Agree with others re. no real tan colours on display: though investigation shows that the use of tan, across the twentieth century, has variations from light to mid-dark but always with a muted form, rather than a strong, nutty or woody brown. Great range of outfits. I like a nice mid-brown shoe with a charcoal suit when it’s more casual. 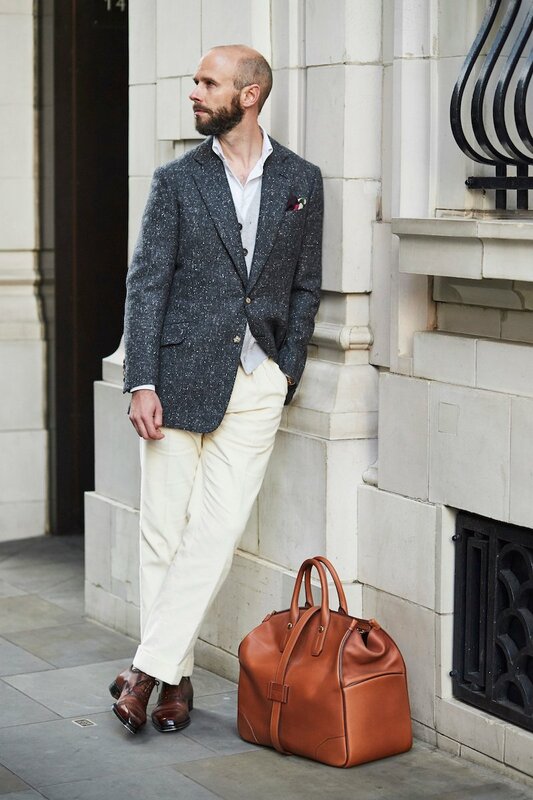 And of course white shoes are one of the most versatile casual shoes, but I guess we’re only talking tailoring here. I thought long and hard about adding a comment but eventually decided I would. I enjoy Permanent Style and value the insights you offer but for me this is not one of your better posts. The question of what constitutes tan has already been raised but I would add that the differences in the pictures between shades of brown don’t seem distinctive enough to back up or illustrate the undoubtedly good premise. The Benedikt Fries images likewise, for me, don’t really add anything. To round things off, your comment that people who don’t understand the point you are making can “just scroll through the pretty pictures” comes across as a tad patronising which I am sure you didn’t mean and jars with the general tenor of this place. Sorry to seem negative and I’m probably in the minority. I look forward to the next post. Not at all Ian, thanks for making the comment. The point about scrolling was meant to be just funny and self-deprecating. Sorry if it didn’t come across that way. Definitely agreed dark brown shoes look better with a darker top. And, to be honest, I think you can get away with darker brown shoes (especially the mid brown shades like EG burnt oak) even if the top half is lighter. Given that, I’d be tempted to suggest a new rule; don’t wear tan shoes unless you know exactly what you’re doing! When you spend some time – summertime – in Dixieland below the Mason-Dixie Line, you might see shoes which are called “white bucks”. A famous exponent was crooner Pat Boone – check You Tube. I guess white bucks may be worn by cricket players, too, so you’ve seen them and consider them sport specific. Please advise me which is the strongest cloth for coat pocket linings which get abused by thoughtless & brutal treatment of certain coat wearers and thus must be replaced? Thanks Peter. I know them, even have an old pair from Lodger that might qualify. in the end you are just moving the contrasting element of the outfit from shoes to trousers. i suppose that overall outfit harmony is key how the idea of the post works. Simon, I have to say, the first thing I noticed was your jacket, and specifically the closed quarters on it and the overall length and shape. 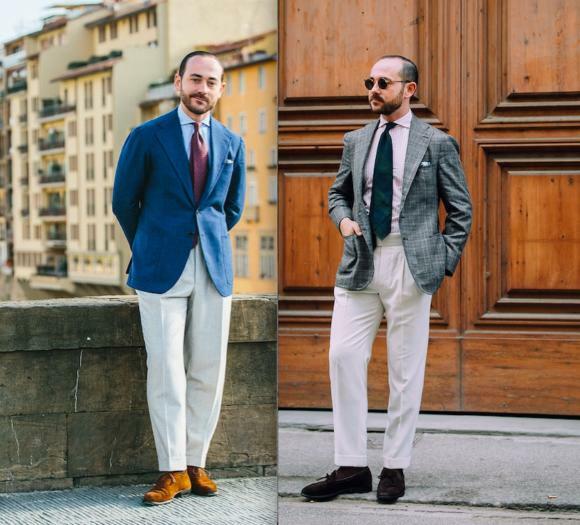 I fear the photo, to my eye, points to the superior look, fit and feel of your Neapolitan sport coats in more casual outfits such as the one you have on. My second observation is that Benedikt’s outfit on the right with the darker jacket and darker shoes, while still superior to 99% of what I see in NYC, just seems too jarring in the contrast from jacket to trousers to shoes. 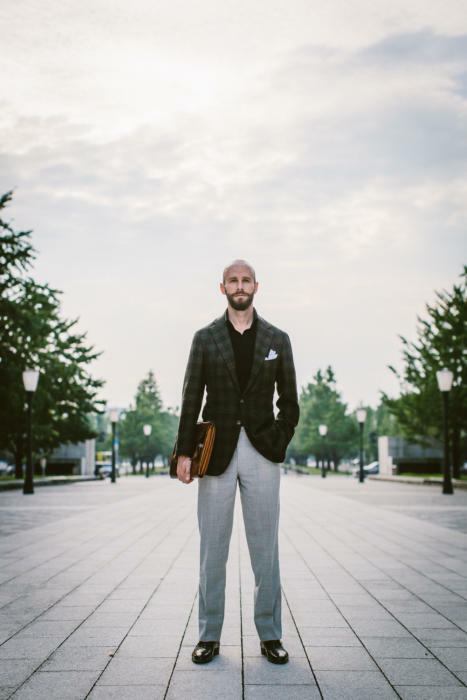 I agree with the premise that shoes should be consistent with the overall shade on the the top half, but I also think it is possible for there to be just too much contrast back and forth from shoe to trouser to jacket. In my mind’s eye, that outfit looks superior with a mid gray trouser. I also think a “polo” colored suede shoe has the ability to play lighter or darker. I am willing to wear that shoe with a darker jacket if it highlights a lighter color up top (copper tie, orange check in a jacket). In fact, I was wearing just such an outfit when I met you at the NY symposium (although I don’t expect you to remember :). I’ve been invited to a casual drinks party tonight and can’t decide what to wear. I’ve chosen bottle green cords and dark brown suede loafers so far. What colour socks? And I can’t decide between a white Oxford button down and a blue one. Any advice? I think l will wear my rust coloured tweed jacket. as beeing one of the PS Nerds, this is an interesting article. I have thought about the right use of tan shoes often, because I own two pairs of tan RTW boots (one in a “whiskey”-colour, similar like your adelaide shoes from Gaziano & Girling and one in orange brown) , which I bought unfortunately before I knew PS. Now I struggle how to make use of them in the winter. Your mentioned problem of a dark upper half seems to apply in winter much more, since many coats and jackets are navy, brown or green. And they are usually worn buttoned up, so the shirt/tie combo isn’t visible. What do you think? Or would it be possible to compensate this with a light coloured scarf? Yes a scarf would help when all buttoned up, and without the coat on a white Oxford shirt perhaps? That would lighten things up. Or a mid to light grey jacket or sweater. I don’t know why exactly but white and cream trousers seem off to me when worn in the colder months. Were there ever rules that support my position? Yes, not wearing white after labor day… You can definitely see why it makes sense, but personally I like them on a bright cold day. Of course not wearing white after labour day is unique to the USA. The convention doesn’t exist anywhere else. Indeed. My impression is that most guys in America aren’t aware of it either – so I guess I’m most interested in the reasoning and tradition that led to that being established. You’re right, but it seems very much that females follow the rule. When we lived there they couldn’t believe that my wife was confident wearing bright colours after Labour Day when they were dressed top to toe in black. Where is the brown/rust colored overcoat from in the 6th photo from the top? Liverano – my ulster coat. It seems that if a man wishes to limit the colours of non sneaker shoes in his wardrobe he’d be best served by having black and very dark brown shoes only. That would cover all the bases he would need! Darker top half lighter trousers. I’m not sure what rule is being broken here if the primary concept is wearing darker shoes than trousers. If the rule is light trousers call for tan shoes, I never knew of such a rule. Leaving all that aside and notwithstanding the opposition on this point, lighter browns can work with charcoal and navy…particularly if the shoes have darker accents, or styling accents, such as brogueing. Just my opinion. BTW, love your zeal for clothes and style and never miss your posts! Thanks Michael, good point. The rule isn’t really being broken, you’re right. It’s more that I find people tend to expand the rule of darker shoes than trousers, to always wear tan shoes with light trousers. It’s something readers have commented on in the past. I don’t see any rule breaking involved in wearing brown shoes (tan is a rather unspecific description suggestive perhaps of light brown) of varying hues with pale pants and vice versa. As ever it all depends… on formality, color, fabric texture, etc. Wearing mid brown suede shoes with a blue chalk stripe suit works fine but although I’m American, and Americans favor this (Alan Flusser for example), I don’t personally like dark brown calf shoes with the same blue suit . This is one occasion when you should take Stanley Holloway’s advice. Light brown shoes with blue suits or pants although not uncommon in the US look appalling. I find that when you get dressed you immediately know if something looks wrong, whether it’s a tie with shirt and jacket, or shoes (color, weight, style etc.) with your overall look particularly pants. Then you do a quick switch. It’s largely instinctive at least ultimately. Long time reader. I really think dark brown shoes are just the cornerstone of a good conservative shoe collection. I agree that the lighter more walnut type shoes are definately limited in scope. However, I would love to hear your views on shoes that veer towards the more red part of the spectrum. Cherry, wine burgundy seem to be out of fashion now. Would love to hear your thoughts. Keep up the greatwork. I rather like wearing tan shoes with a navy or charcoal grey suit or trousers. However; I would say that the colour would be chestnut tan in leather or a Tabaco suede tassel loafer. For the summer a nice pair of tropical or leaf green cotton trouser with cognac coloured loafers or plain loafers goes down well. It occurs to me Simon that the recent craze for patination might involve a subconscious response to the principle of top/bottom balancing which you articulate on this thread. Aside from marking individual wear and longevity, and foregrounding a commitment to log-lastign and artisanal products, dark patches may making tan/light brown leather suitable for a wider range of outfits. Do you agree that this is the effect, aside from the possible conscious or unconscious motivation? Yes, having greater variation in colour does make a shoe easier to match in that way. Often I find patination is too extreme though, and can make shoes too showy and hard to wear in an outfit. Burnishing is a more subtle and (for me) better way to do it. Burnishing, just in case you don’t know, uses a wheel and friction to darken areas of the leather – it’s what gives an ‘antique’ look on shoes, something largely started by Edward Green in the UK. Thanks Simon. Incidentally as a result of reading your thoguhtful posts I am now finding it takes me longer and longer to choose my shirt and tie in the morning. I hope this is temporary, and certainly that it doesn’t get any worse. Oh dear, sorry to hear that. I guess just think of it as the workings of a more refined and discerning taste? I’ll settle for Socrates dissastisfed. This morning I decided not to wear a tie, but still found myself stumped by the balance between top and bottom halves (trousers slightly too blue and shoes slightly too brown). I managed to persuade myself that this was just about patched up by my pocket square. If this keeps going on I may never make it into work. Incidentally and off topic can I suggest a possible subject for consideration: how to dress in the evening- ie specifically evening wear which is not black tie. I think this a pressing sartorial issue (possibly the issue facing civilised men), as a cursory examination of the audience at Covent Garden will reveal. A few tourists and eccentrics wander in in black tie. I have nothing against this code, but it only works if adopted uniformly, and sadly that ship has sailed aside from formal dinners and Glyndebourne. So what should a man change into at 6 o’clock? Interesting article and informative., but not quite where I’m coming from. Although the outfits are all lovely, 1, 3 and 8 are black tie and 4, 6 and 9 are daywear. IMHO. Shame the velvet jacket is quite so fancy dress, as the velvet jacket a la Tom Ford seems to me the most obvious answer. But what makes an evening outfit work? I suppose what I’m getting at are what the indicia may be of eveningwear as opposed to daywear- in the way that patch pockets, open quarters and unstructured shoulders move a jacket in the direction of informality, or jet pockets, lack of vents and contrasting lapels demarcate a dinner jacket from an ordinary suit jacket. I greatly admire your pieces in which you seek to formalise one’s instinctive thinking about issues of what does and doesn’t “go”; the border between modern day and evening formalwear might benefit from examination. Less well-trodden than what is “smart casual?” Probably more contentious. Perhaps we need more sartorial rules not fewer.